My Radio is a FTDX-5000. 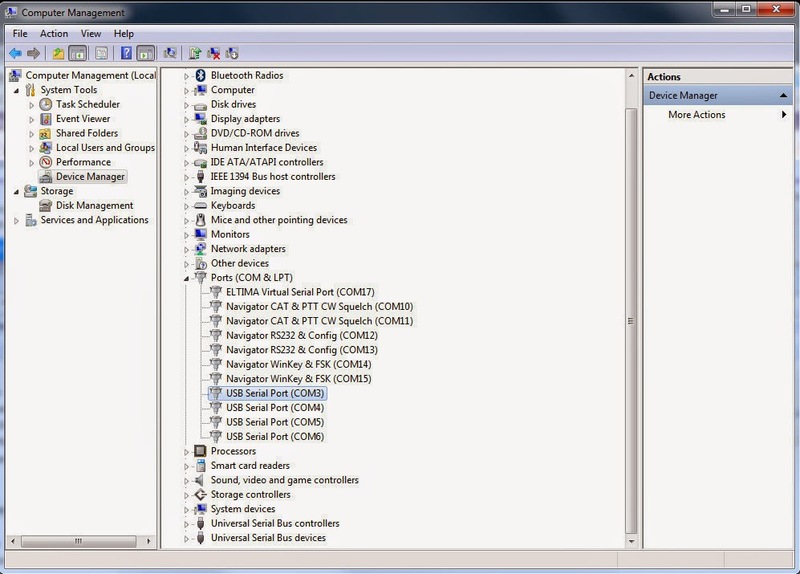 I use a MASS of things such as "HDSDR", "CW Skimmer", DXLabs Suite (commander, spotcollector, dxview, dxkeeper). These apps have all been sharing 'COM3' via LPB2 (LP-Bridge) which is a comm-port sharing application. The HDSDR requires access to the my FTDX-5000's CAT control serial port in order to keep the radio in sync with the Panadapter. DXKeeper uses CAT to log the frequency of a QSO. Additionally my computer has no onboard serial ports, so I'm using a USB/Serial Port cable that provides COM3,4,5,6 LPB2 has been set to use "COM3", and my other apps that need to share the CAT control via that port use virtual ports created by LPB2. I've used this setup for about 4 years now with no issues. I've recently purchased a Timewave "Navigator" Interface. So now I have to re-think this stuff a bit. Navigator is ALL-NEW-TO-ME. I'm still trying to just understand some of the basics, however I am now able to connect the DB9 cable which comes off the DB25 'tranceiver' port on the back of the Navigator to the Com Port of the FTDX-5000 and I am able to use COM10 as the "PTT" to key the radio for WSJT 10. So I'm able to operate WSJT modes now. 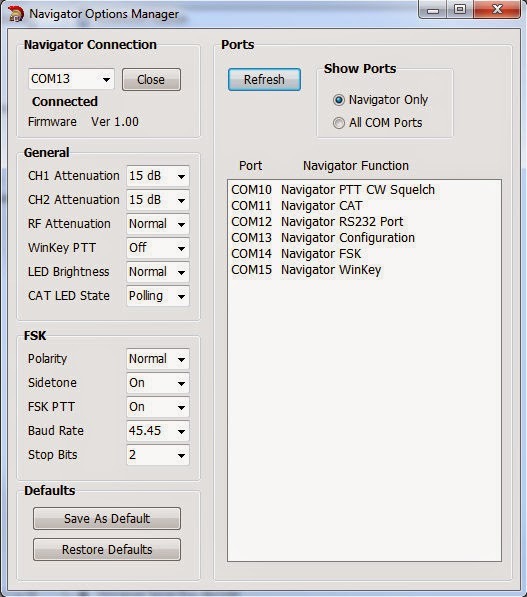 The issue I have, is that Navigator is what is now directly connected to the Comm Port on the FTDX-5000. 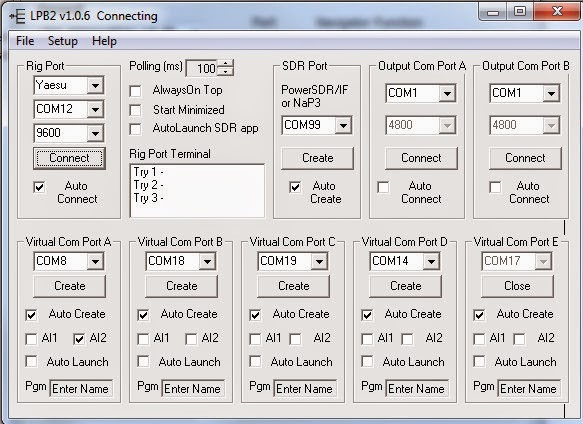 What I would like to do is simply setup the "Rig Port" in LPB2 to one of the ports that are related to the Navigator and run all my other apps at same time that I'm operating with WSJT. I've tried a lot of different methods, and none of them have worked yet. This is really my own ignorance so far. I'm posting this to try to relay what I'm looking at, in the hopes that someone else has already done this and can help guide me where I'm going wrong. Please post your ideas in the comments or email me directly. My email is valid in QRZ.com for NW0W. I have HDSDR running on COM20 via OMNIRIG RIG#1 now and that connects to the SDR Port of LPB2 as shown above. 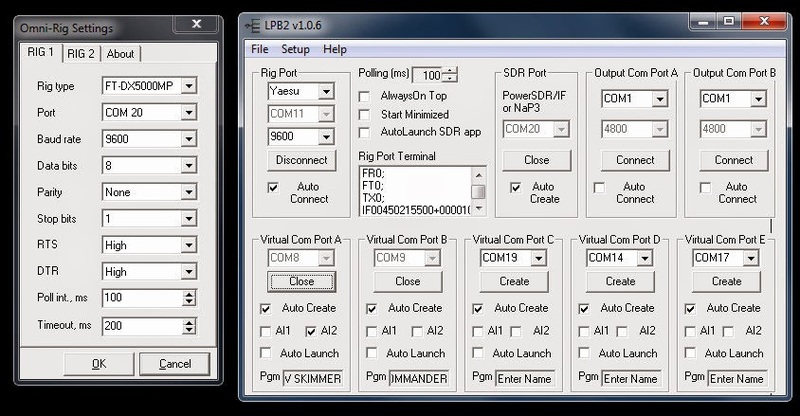 CW Skimmer is using COM8 via OMNIRIG RIG#2, and DXLABS stuff is using COM9 also see above LPB2 screen shot. Also Note I adjusted Menu Item #34 to disable (CAT RTS) on the FTDX-5000. With these changes everything I used to run works fine. PLUS I'm able to also use Navigator running with WSJT 10 at the same time, and everything seems to work (so far). I'd like to thank Clint KK7UQ For some helpful guidance!